Looks just like someone we know. I had the most awful day today! 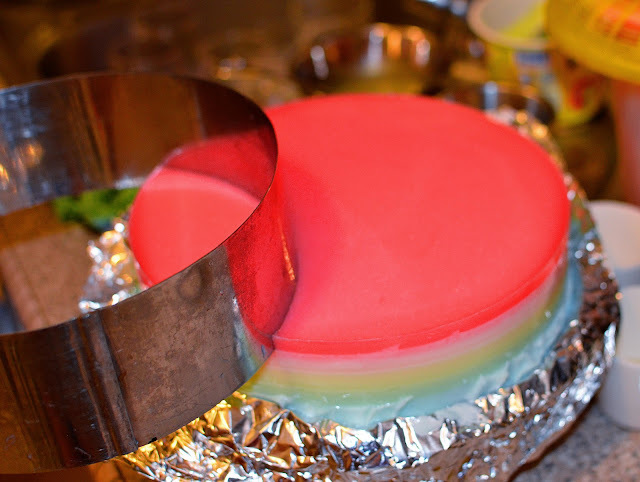 I made 2 jellies for the challenge and then I realised that I didn't have time to bake a birthday cake for my son Wey who turned 17 today so I made an agar cake instead because agar sets quickly. I was getting ready to cook a special dinner for my family and in-laws when I opened the fridge and the agar cake, which unfortunately was on a cake stand, slipped and fell onto the floor! Why do these things ALWAYS happen to me? But all wasn't lost because the top 3 layers of agar held together well and stayed on the cake stand. The bottom 4 layers had slipped off and were totally smashed. Lesson: when you make jelly layers, always pour hot jelly liquid over the previous set layer to meld them together. It was 4:30 pm. I wondered whether to make a new one or go with whatever's left. There wouldn't be much sunlight left for photography by the time I finished another cake. But being a perfectionist and an optimist, I went ahead and made another one anyway. It didn't set until about 6 pm by which time the sunlight was nearly gone because today was a cloudy day. 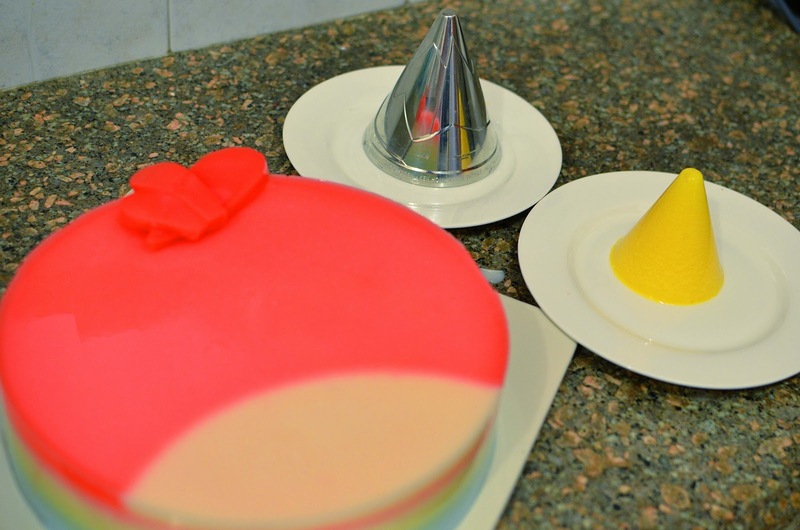 I gave up and posted photos of the first agar cake at 9:51 pm but got an almost immediate comment about copyright. That bugged me so I went downstairs and started on working to change the bird's features. I made a bigger beak, a different crest, different eyes, a tail, those brownish feathers on the cheeks and a peach-colored chest. Uploaded just a minute before the deadline. It's been a long day but I'm happy that this turned out even better than the first one. I didn't think I was going to include this cake as part of the Jelliriffic! challenge but my daughter said that it qualifies since I used the mould to make the beak so I'm saving the other jellies for tomorrow. Sometimes, mistakes can be a blessing. 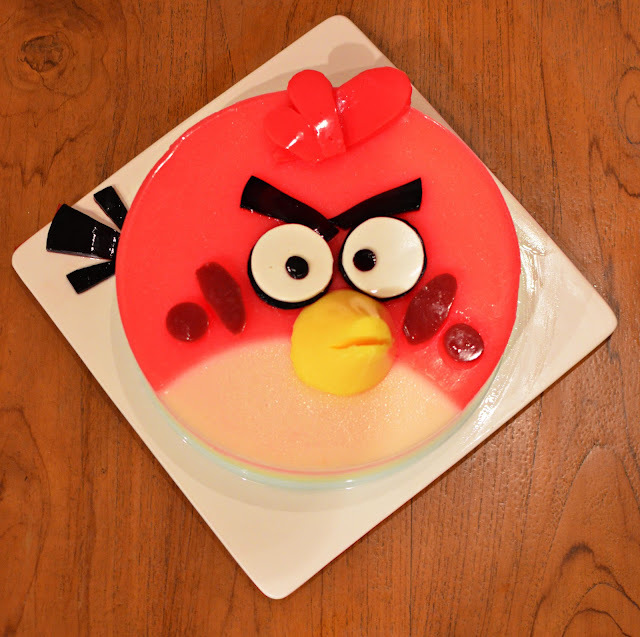 The brown patches on the red bird's cheeks were stains from the grass jelly (the eyes) on the red jelly of the first cake. My daughter noticed the brown patches and suggested that I use the stained jelly to make them. I'm so happy with the way the beak turned out (thanks to the Jelliriffic mould!) because it made the bird two-dimensional. Cutting the agar with the ring pan to make the peach-colored chest. This was at 11:20 pm! The decision to make here was to leave the nose straight or angled. I decided to angle it. 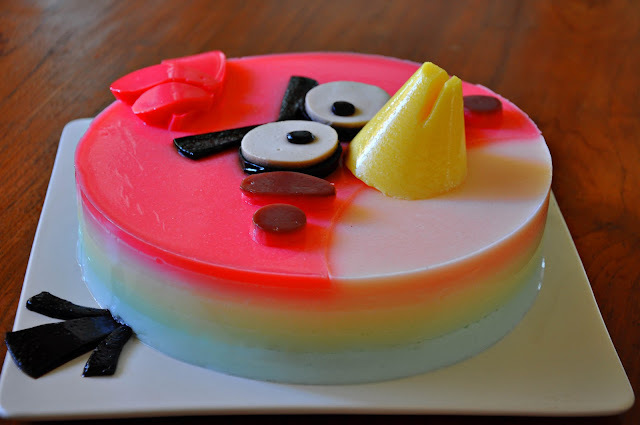 The beak was made using the Jelliriffic! mould. Quite brilliant eh? 1. Wrap the bottom and side of a 9 1/2" or 24 cm ring pan with strong aluminium foil to prevent any leaks. Place over a flat serving plate or cake board. 2. Put 200 ml water into a small pot. 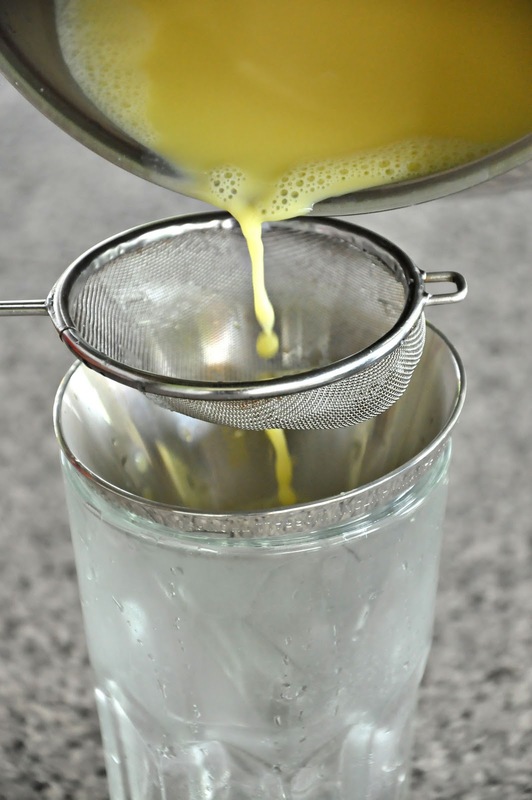 Mix 2 tsp agar powder and 50 gm (will be quite bland; add more to your liking) caster sugar and scatter over the water. Heat, stirring all the time until sugar and agar are dissolved. Remove from heat, add 300 ml room temp water and 2 tbsp of cream or thick coconut milk or replace 50 ml of the water with evaporated milk or fresh milk. Mix in some color. 3. Pour into the pan and leave to set. Meantime, work on the next layer. If it gets cold by the time the first layer is set, you have to re-heat it before pouring onto the first layer or the layers won't stick together. 4. Repeat for another 3 to 4 layers of different colors, ending with a red layer. The second layer from the top must be white or peach so that the top layer of red can stand out. 5. The black of the eyes are made from store-bought grass jelly, the white from agar and the beak (Jelliriffic! mould) from agar. Use the ring pan to cut the lower third of the red agar and remove it to expose the beak. Note: if like, use medium-thick coconut milk instead of water for a delicious agar cake. Also, if you want thicker layers, use a total of 600 ml liquid to 3 tsp of agar. * The red bird yells out, 'Caw caw!' when launching attack! It cannot be cuter! I hope no patent or royalty for that hahah! I have no idea what angry bird is about altho ive heard of it...but it looks really angry and cute at the same time ....good job. Love the colours. Sometime i really don't feel like viewing your blog because of those desserts and dishes, it tempt me and make me so jealous of WeyWey, who always get to taste them. Do you mind to courrier to me pls? LOLOLOL. You kept me laughing post after post. 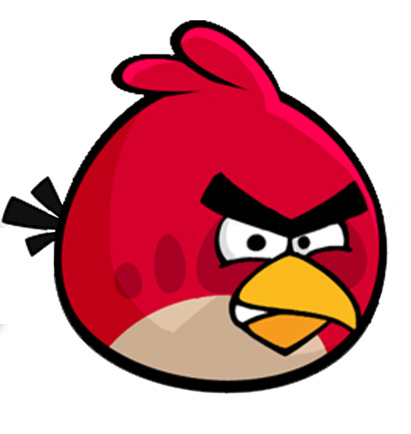 As for the Angry bird, I don't know how you do it. I can't make something as artistic as this in a million years! You're amazing! Too bad you live in Malaysia because I would've gladly submit your name for the hit series The Great British Bake Off. omg that is so cute! hahaha! my brother will love this. Anyway Happy belated birthday to Wey! Love this! Jelly is so fun so using it to make a cartoon game is just so fitting. You're such a SUPERwoman! Making jelly in the day, cooking family dinner before making jelly again before the deadline. Really selfless of you. I'm sure your kids appreciate you very much. Hope you had a good and well deserved rest after that! This is so pretty and cool. Never thought of making jelly in place of a birthday cake. Terrific idea, although I suspect it takes longer than making a cake. I love the artistry and colour of angry bird. You are superwoman Terri; keeping your cool and achieving all that through disasters. Your kids and family indeed blessed to have such a caring and dedicated and determined mum as you. Your jelly posts makes me think that I might make a jelly cake for the next birthday that is coming up in my family. But I don't think I will make such sophisticated and complicated stuff as yours. I'm too lazy and it's too arduous for me. But you are on track to getting that prize, Terri, yes, you are! wow....what a day i must say. but you did really really well. in the midst of the challenge, you still manage to entertain guest for your son's birthday. superb! love the colours of the jelly and the beak sure stands out. Birthday greetings to Wey from the Gohs! 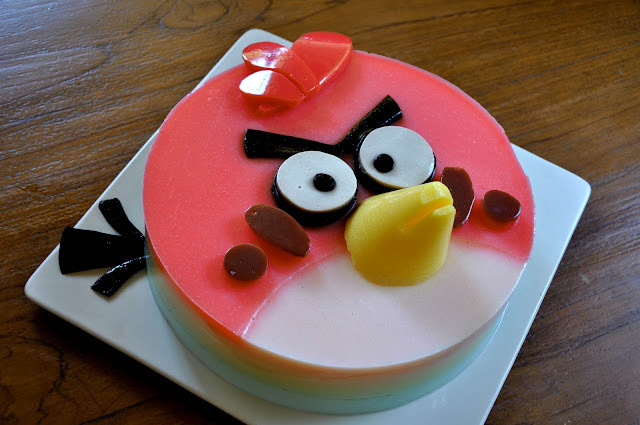 He deserves the Angry Bird Jelly 'cake' and you are the best momma in town to spoil your children loads with good food and fabulous desserts. Cheering you on, just relax and enjoy what you are doing. You will be fine, dear. Very beautiful contrast of colours and the mould crafted the beak perfectly. You should win, hands down! I don't know where all your creative ideas are coming from, I am speechless. I love everyone of your jellies! This is cute.. Should get quite a bit votes from the iPod generation.. I love how your turned a negative into a positive!! You're amazing and so is your Very Angry Bird! This is just phenomenal and can"t believe that you are so creative since I last left KK. Oh Mine.....it's ANGRY BIRD.Wheeee bom....my favourite.....it is savoury. How I wish I can sink my teeth in it....MMMMMMM. love this jelly, I really like the angry face of this bird, it looks cute and perfect, thank you so much for sharing with us.. Your cake looks awesome! May I know how do to make the jutting out part stick to the base / bottom layers? Do you just chill it will do?